Are you thinking of starting a blog or creating a website to promote your business or profession, or do you just want to share your thoughts on a subject that you love? Blogging is either free or inexpensive, and you can get started in moments by creating a blog on a site like Blogger or WordPress. To develop your concept, launch your website and promote your writing, this article will show you what you need to get started. Why you should create a blog and join the blogging community? So, I’m going to outline exactly what you need to do to get started and set up your own personal blog. Before we Start, I really want to talk about WHY you should build a blog. Note: If you already have an idea of this, then skip this and go right ahead with the guide. Blogging has quickly become one of the most popular ways of communicating and spreading information and news. There are literally millions of blogs online (you can make yours stand out and get noticed! ).It’s a great way to express yourself and also a fantastic way to share information with others.You become a better person and a better writer.The best Reason Is That You can make Money doing it! Creating your own blog can take a little while, probably up to 30 minutes. So grab yourself a coffee or juice (whatever or whichever one You Prefer) and let’s get stuck in. If you need any help during the set-up process, just contact me from here and I’ll do best to answer any questions you might have). Before you can even start worrying about how your blog will look like, you’ll need to choose your blogging platform. Choosing where you want to build blog is pretty much the first thing you have to do. I’m going to take a leap and assume you’ve heard of WordPress, and this is the platform I'm using. It's my favorite. 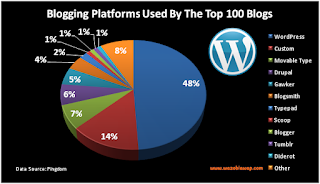 There's a lot of blogging platforms you can choose from. Such as WordPress, Blogger, Tumblr, Drupal, Joomla, SMF, and losts more. But I recommend WordPress for You. Wordpress is one of the biggest blogging platforms in the world, with countless plugins and add-ons and almost infinite ways to design and layout your blog. Drupal: This is also a cool and very simple to use platform. Looks like wordpress though. Tumblr: Half social network, half blog. Interesting, and very simple to use as well. ✔ There’s a massive support forum in case you get stuck (you won’t, but it’s nice to have it there if you need it). ✔ Your blog will be insanely fast and it'll also look Functionality and form perfect! ✔ People can interact with you easily. Your content can be shared, commented on, and so on. ✔ It’s secure; WordPress is always updating their software and keeping everything sound and secure, so there’s rarely a worry of having your blog come under hacking attacks. 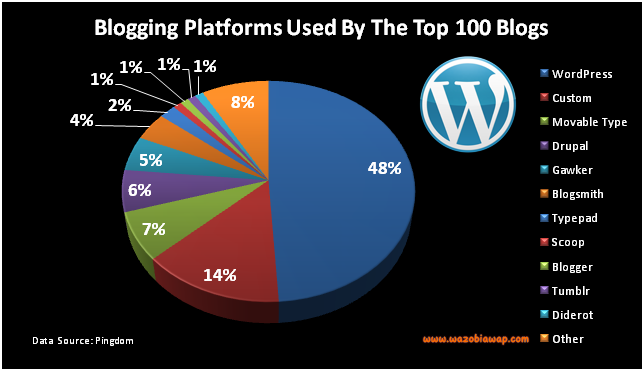 No wonder Sony, NASA and even university blogs are using WordPress. ✔ It’s HIGHLY customisable. There are hundreds of free themes and plugins that add more functionality to your blog, from contact and subscribe boxes to plugins that improve blog performance and more. Other blogging Platforms are generally all pretty good, you can still go ahead and make your choice. I will go with wordpress since that's the platform I'm using. If you have to go with wordpress continue reading. Nothing Good Comes For Free we use money to make more money. Just like some of my newbie bloggers in Nigeria who wants everything to be free. domain name FREE webhosting hosting FREE. And they expect to Earn From It. Don't fool yourself by wasting your time on free hosting and domain. Think About This - Which famous, successful blogger you know is using a free blogging website? 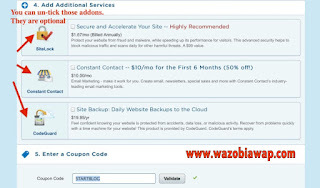 You domain name should look like this for example wazobiawap.com, and not wazobiawap.freeblogs.com or wazobiawap.freehostingweb.org and so on. ✔ The web address of your blog will be long and hard to remember:(like yourfreeblog.blogspot.com) instead of a catchy, branded address you choose. ✔ You’re not allowed to advertise: on most free blogging platforms you cannot advertise or display ads some display there own ads on your blog, making it much harder to ever make money from blogging. Don’t get me wrong: If you really don’t care whether or not your blog will be successful, go with free blogging platforms. They’re an okay way to try out blogging for a little bit. For Beginners use it as practical platform and see if you can create a blog. But if you ever want to look credible, build an audience and make money blogging, then you need your own blog, on your own domain name, with your own hosting. That way, you make the rules and control your content. Now to exciting part! To set up a self-hosted blog on your own domain name, you’ll need two things. You’ll need to come up with a domain name you like and also choose a hosting company that can host your blog. Domain name: This will be your personal blog address where people find you over and over again. For example Google’s Domain is Google.com. Your new blog domain name will be YourBlogName.com, except you’ll choose what’s going to be behind YourNewBlog. The cost of a domain name is usually $10/year, but if you follow this guide all the way, I’ll show you how to get one for much cheaper. Web hosting: This will be the home of your blog address and content that’s on the blog. Without web hosting, you’ll be unable to use your domain. Think of it as a computer hard drive that stores all your content on your blog (images, blog posts and so on). Hosting is basically the company that puts your website up on the internet so everyone else can see it. The cost of web hosting is usually somewhere between $2-5 per month. When it comes to hosting, there are only few things that you should consider. Bandwidth: 'Bandwidth' describes the rate at which data can be transferred to your computer from a website or internet service within a specific time. Therefore the amount of bandwidth you have (the bandwidth 'strength') determines the efficiency and speed of your internet activity – that is, when you open web pages, download files and so on. This is also the number of visitors you can get per-month. As a beginner your are not required to buy a large bandwidth. You're only required to upgrade your bandwidth as time goes on. Disk Space: Disk space is the amount of data you can store on the web server. Obviously, the amount of space needed depends on the size of your website . Most websites are composed of HTML (text), images, Flash, or a combination of all..The is the amount of space available for media and files upload. You can buy depending on the type of blog you want. Page load speed: The average amount of time (in seconds) it takes your blog to load. UptimeUptime is the amount of time that a server has stayed up and running. This is usually listed as a percentage, like "99.9% uptime ." Uptime is a great measure of how good a Web hosting provider is at keeping their systems up and running. As for me, 99.9% isn’t enough (it’s 42 minutes of downtime per month). You should be aiming for 100%. There are many domain and web hosting providers out there. They all offer you a similar service (domain + hosting) with a similar Price. 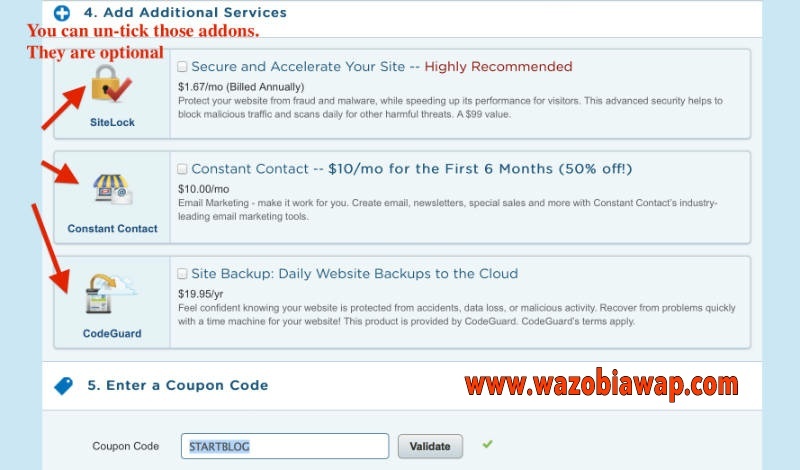 Hostgator, Philmorehost, Bluehost, iPage, Web4africa, Godaddy and so on. However, you can go with any web hosting which you like or choose as long as it’s fast, reliable and offers unlimited storage & bandwidth. This helps you to avoid problems later on. I am Going to use Hostgator as an example in this article. HostGator have great performance, they are easy to use. Welcome to step 3. You have to pay attention and read along gently. If you don't understand, just read it over and over again. I promise you that at the end you will have your own self hosted website. Good Luck. Visit www.hostgator.com and click on "Star Your WordPress blog"
If you Already have a domain name, Just write it in the right box tab [I already own this domain] and keep moving to the next step by scrolling down a bit. 1. Easy to Remember or Spell: Don’t choose a nonsense name, something tough to spell, or a long name full of dashes. “www.best-tech-blogs-in-the-world.com” won’t ever stick in someone’s head, but something like “www.bluewap.com” is a good example of domain name. 2. Unique and Descriptive: You want a name that reflects who you are and what you care about. Be creative and build an identity you’re excited about!. Don't use domain name similar to another person's domain. 3. Trustworthy: Domain extensions like “.com”, “.org” or “.net” are the most popular, with “.com” being the one most people think of first. Try to avoid crazy extensions like “.rocks” or “.biz”, as these are less commonly used, tougher to remember and not as trusted. Choose the “Hatchling” plan for now because it's meant for beginners – you can always upgrade later if you decide you want more advanced features, but you get more than enough with the Hatchling. It may take a few minutes for HostGator to register your account, so be patient. You should get a confirmation email when your account is ready. Check the email address you entered during registration for your confirmation. Once you’ve logged in to your control panel (all the information you need for that should be on your inbox) , it’s time to install WordPress. This takes just one click! You are going to use Mojomarketplace.com in hostgator but in other hosts you might use softaculous.com script Installer or any other script installer as the case may be for your one click wordpress install. Now Log-in to your Hostgator control panel Look about halfway down the page for the left sidebar section Click “Install WordPress”. Once clicked, you’ll be automatically transferred to Mojomarketplace.com. 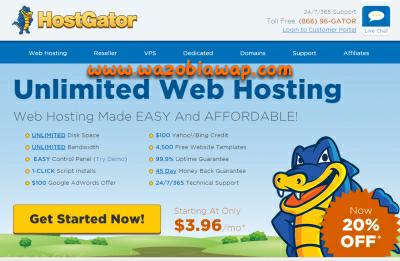 Like I said above this is just a site that helps HostGator install platforms (like WordPress). Click “Install” and then fill out the form that follows. 1. Navigate to the MOJO Marketplace section inside cPanel. 2. Click the One-Click Installs icon. 5. Choose the Domain Name to install it to. In the field next to the domain, you can enter a subfolder such as 'blog' if you want it to be blog.yoursite.com or leave it Blank if you want the site's main page to be the blog. 6. If necessary, you can edit the Email Address, username and password for the new Wordpress installation. Click "advanced options" and you can change those settings. 7. Read through the license and service agreements and check the boxes. 8. Select the Install Now button. To log in to your blog, click the admin URL. If you forget this URL, it’s simply www.yourblog.com/wp-admin(where “yourblog” is your domain name). 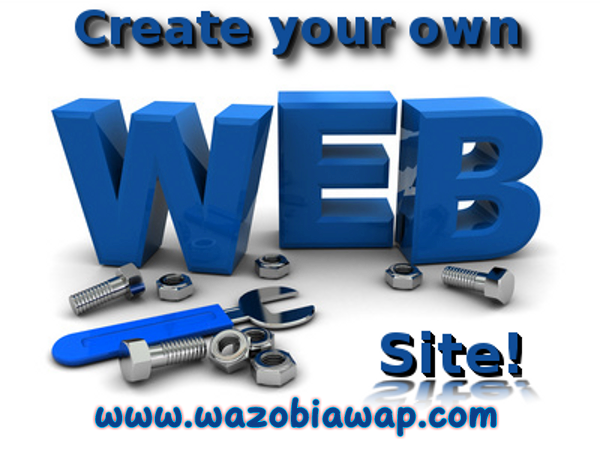 Congratulations – you now know how to create a blog / website using WordPress. You’ve installed WordPress and set up your blog, all on your own! As you can see, it was really easy and fun. Dashboard: shows you an at-a-glance look at your recent activity, including how many posts, comments and pages you have. You can also write up a quick draft blog post here – if you have a wordpress seo plugin, it will show your posts seo scores too. Home: this show an at-a-glance view of your website. It shows all the recent Activities on your website. It also shows comments caught as spam. Updates: here you can find your wordpress update, themes updates, plugins and widgets updates when they are updated. So you update them through here. Themes: this is where you can find your website theme. You can manage them by activating and deactivating them or adding new ones or deleting non-active ones. You can browse a whole lot of themes through here. Search for themes both new and old by categories. Editor: this is where you can edit your themes .php file. For example index.php or header.php. Plugins: is where you’d click if you wanted to install a new plugin, like a photo gallery or SEO tool. I’ll show you how to do this in a moment. Users: this is where you can edit your profile, add new users and edit current users and their roles. You can edit users rank right here. Settings: is the last section you need to know about. Here, you can change your site’s title and tagline, edit your email address and manage all of your site’s important settings. A WordPress Theme is a collection of files that work together to produce a graphical interface with an underlying unifying design for a weblog. These files are called template files. A Theme modifies the way the site is displayed, without modifying the underlying software. WordPress website platform uses design templates called “Themes” to figure out how your site should look. Changing your blog’s layout and design is as simple as installing a new theme. There are over 5,000+ professionally designed, fully-customisable and free wordpress themes to choose from – so you’ve got a lot of options. There are also a lot of premium wordpress themes with good design which you can purchase for your website. If you want to see more premium type of templates and themes, head over to Themeforest.net. One more thing "Avoid using Nulled or Cracked themes or scripts" because most of them does not have license. You host can terminate your account if they discover any theme or script without license. You can get free themes that has license at wordpress.com which you can modify to be yours. Log in to your wordpress dashboard and scroll down tothe “Appearance” tab in the WordPress sidebar, when it drops down, then click on “Themes”. On the next screen, you’ll see several themes that are already installed. If you don’t like those ones, then click the “Add New” button at the top, to start searching for a theme. On the next page, you’ll see tabs where you’ll find featured, popular and new themes, as well as a “Feature Filter” and search bar. I really like the “Feature Filter” option, because you can choose themes in certain color schemes, select specific layouts and even choose themes with built-in advanced features. Just choose the options you want, then click “Apply Filters” on the left hand side. If you’re finding this challenging, just search by keyword – if you are looking for a magazine theme, just type the keyword "magazine" in the search bar and wait for results on the next page. When you’ve found a theme you like, click “Install”. You’re nearly done!. Wait for the theme to finish installation. After the installation you can Activate or Preview the the before activation. If you clicked Activate, after successful activation visit your website and see your new theme. That's kind of you. Thanks for stopping by and I hope you will visit us again.